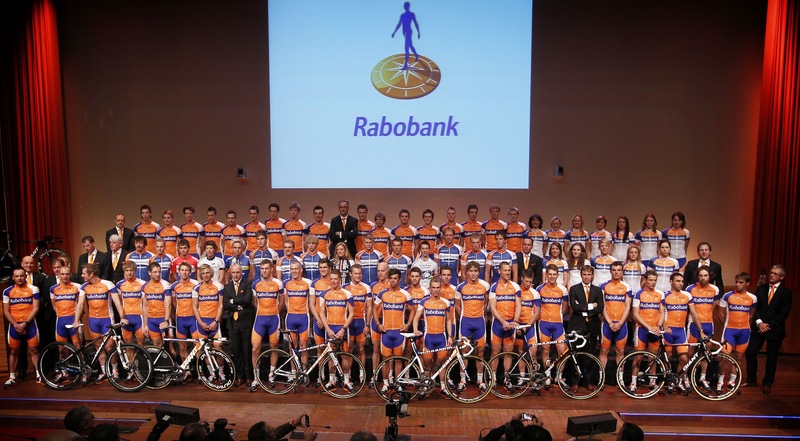 Shocking news today – after 17 years in cycling, Rabobank is no more. The bank will continue to fund its teams for the remainder of their contracts, but the jerseys will be without their name and logo. The men’s team will stay together next year, riding in blank jerseys in a kind of T-Mobile/High Road deal. However, management only have 2013 to find a new title sponsor as the bank’s funding will then run out. Current bike manufacturer Giant is reportedly considering taking over the sponsorship. There is good news – Marianne Vos will receive funding up to 2016 (it is unclear if there will be any funding of the women’s team), while sponsorship of the cyclocross and continental men’s teams, as well as the Dutch Cycling Union will continue. Bruggink went on to say that the decision to leave the sport came as a result of the USADA report, and the complicity of the UCI in the US Postal conspiracy “The report shows that the international cycling world is flawed. Doping is supported even within the highest institutions of the cycling world. Our conclusion is thus that there is no way out of it, which is why we have decided to stop supporting the professional teams.” It is a damning indictment of the governing body, which has time and again failed in its attempts to rid the sport of doping. There have been quite a few of Rabobank’s riders and staff (past and present) in the news in recent days, with Menchov part of the Padova investigation, a doctor and rider named (redacted) in Leipheimer’s affidavit, Luis Leon Sanchez was named by Bileka as a Ferrari client, and the Rasmussen lawsuit against the team going back to court in mid-November. In addition to that, the UCI have just started a disciplinary procedure against Barredo on the ground of suspected blood doping (likely in relation to his time prior to joining the team). With no doubt more to come in all of these scandals, Rabobank have no doubt saved themselves from a good deal of negative publicity in the future. Lotto-Belisol have come out with a statement relating to Rabobank’s decision. They say that they understand the decision but are taking a different approach, advocating “a move towards pure cycling” and say that “Young starters, talents and champions of tomorrow are entitled to a fair chance in an ethical setting.” It is an admirable statement from the team and mirrors star rider André Greipel’s open letter ‘For a fair and honest cycling‘. It is always sad to see a sponsor leaving, never mind one of Rabobank’s importance and stature. The team had only just brought in a new management structure with specific roles for every ‘coach’ in a bid to look to the future. Lets hope that the staff can look forward to a team beyond next season.